There aren’t many things I do rather than eat. At my previous work they used to call me the bin, since I would eat anything that was offered to me. Whether it’s breakfast, lunch or dinner, starter, main or dessert, I’ll indulge in all. Although I do have a soft spot for desserts. So testing restaurants in Singapore sounds like the best idea in the world to me. If a street is literally called Food Street on the map, then you know you’re in the right place. Eat your way through this street trying out chili crab, peking duck, dim sum or for the more adventurous among us some crispy chicken feet or fish eyes. You can sit on long picnic tables and just hop from one hawker to another tasting the whole assortment of Chinese cuisine. Din Tai Fung has multiple restaurants in Singapore and is ideal for lunch. This place is well known for its dim sum and not without reason. Nibble you’re way through the menu on various flavors of dim sum and definitely try out the Xiao Long Bao. If you are a sweet tooth, than Sunday Folks is your spot. They are well known for their sundays in several original flavors like Chocolate Hazelnut, Miso Caramel or Earl Grey Lavender. Get a waffle, some toppings and a big pile of ice cream and you’ll be one happy camper. Their chocolate truffles are a must try as well by the way. We tried one and then had to stock up afterwards, so if you don’t wanna get hooked, be careful. The area around Ding Dong has lots of nice restaurants with great food. There’s a bit of an expat vibe around here, so a lot of different people looking like they just got out of their corporate office.The food at Ding Dong is fusion combining Asian with Western and South American influences. We had the scallop ceviche with mango here, which was fingerlicking good. So were the duck breast and red snapper with curry, the plates were simply too small. Katong Laksa might be looking like a typical franchise branch, but don’t let it fool you. The laksas here are delicious, full of flavor and with loads of seafood. Try the chili crab pao as well and enjoy all of this with a Tiger beer on the pavement. One of the cheapest restaurants in Singapore that will still make you leave with a full belly. A michelin star restaurant with only $3 dishes? Yes it’s possible. Twice even actually. Although we haven’t tried out Hill st. Tai Hwa Pork Noodle who recently got a Michelin star as well for their $3 pork noodles, we did dive into Hong Kong Soya Chicken Noodle & Rice in China Town. It’s not the tiny little hawker one man show any more. It’s a proper business, reminding you slightly of McDonalds. One guy spends a whole day chopping up chickens, girls taking orders faster than the wind (or even a self-payment kiosk) and the waiting time is probably a lot less if you got good timing. Queues might take up to hours, but we went there during lunch time and had our food within 15 minutes. And delicious it was. Incredibly tender chicken (and very good pork ribs as well) with mouthwatering sauce. Mister Michelin was right. So queue up and indulge! Roasted pork chops and soya sauce chicken, of course. There’s something between girls and chocolate. Well let me tell you this, if chocolate is you what you love, than Ninethirty is you’re heaven. Smart as they are at Ninethirty you walk past a counter full of chocolate goodies before you reach your table. By the time you sit down you surely wanna have five desserts and have breakfast here the next day as well. To make it a little bit easier, try the chocolate s’more and the salted butterscotch brownie. They are to die for (drooling already?)! The perfect way of discovering Singapore’s food scene is by visiting one of the many hawker food centres. These covered market halls have many different food stands that cook you up cheap meals any time of the day. A great one to visit is the Maxwell Hawker Food centre in CBD Singapore. Before you get completely overwhelmed by choices, stop by at Tian Tian Chicken & Rice and definitely try the dumplings at Shanghai Tim Sum. Since eating does make you sleepy, it’s good to know where you can crash down after bulking up. Hotel Indigo Katong Singapore is the perfect boutique style hotel to stay in, in the beautiful Katong neighborhood. Beautiful colorful rooms, with comfy beds, rain showers and even you’re own foot treatment set for tired feet after a long day strolling around the city. Since we’re talking food here anyways, I have to mention their breakfasts as well. They got a huge breakfast buffet with anything you can think off and cook up great pancakes, french toast, and poached eggs with salmon. A few weeks later and I’m still thinking back about (and longing for) their breakfasts. Scallop Ceviche at Ding Dong.. who said I had to share? Omggg thanks for this blog! We love food! 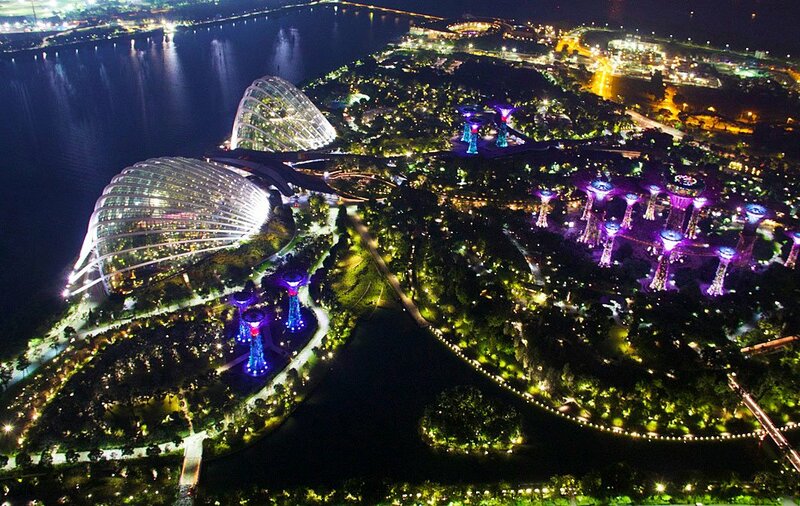 And can’t wait to visit Singapor! I couldn’t have read this blog at a better time as I am in Singapore. I’m definitely going to try one of your recommendations. That s’more though… Looks DELICIOUS! Haha the bin.. Ik ben ook echt gek op eten en ben heel blij met deze guide! Het ziet er naar uit dat ik snel Singapore ga bezoeken dus dan raadpleeg ik deze post zeker nog een aantal keer!